The definitive work on the big game species of South Asia, Lydekker describes in detail the natural history and habitat of game types. He also includes numerous sporting vignettes and observations culled from the writings of sportsmen of the era. Nine full page plates, four folding plates, and fifty seven text illustrations many full page. A rare piece of Shanghai horse racing history, in remarkably clean condition. 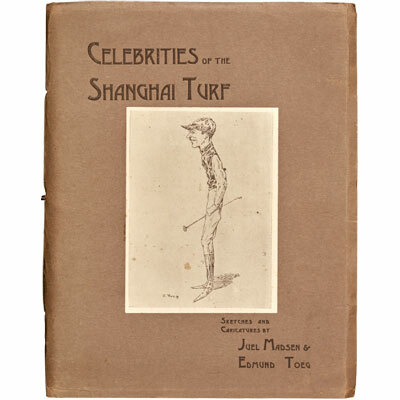 Containing 54 full page captioned illustrations of prominent members of the Shanghai community, by Danish artists Juel Madsen, and Edmund Toeg, with an introduction by A. W. "Bertie" Burkill, Steward of the Shanghai Race Club. 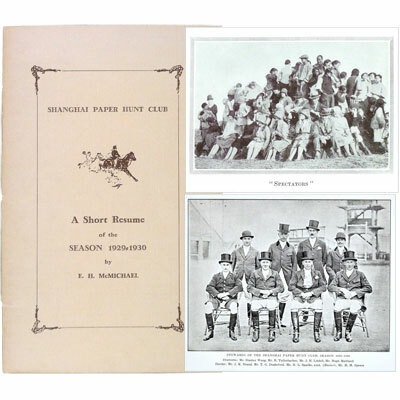 The illustrations consist of 33 individual portraits of members of the Shanghai Race Club, Shanghai Paper Hunt Club, and International Recreation Club, beginning with G. H. Stitt, then Chairman of the Shanghai Racing Club (and Shanghai manager of the Hong Kong bank, interesting trivia – the right hand lion below the HSBC building in Hong Kong is nicknamed Stitt); 5 group sketches of Shanghai Race Club and Paper Hunt Club; 2 group sketches of the Shanghai Volunteer Corps (those featured are named below each sketch); 2 horses; all by Juel Madsen and 12 caricature sketches by Edmund Toeg. Possibly the last publication and showing some of the last sketches by the Danish artist and war correspondent Juel Madsen who was killed in September 1923 in the Great Kantō Japanese earthquake. A superbly illustrated work on Indonesia, and Rajah Brooke, with additional detail on Singapore, Macau, Hong Kong, and the Philippines. Frank Marryat served as a Midshipman on board the H.M.S. Samarang on a surveying expedition to the Indian Archipelago, 1843-1846, cut short in consequence, as Mr. Marryat infers, of the ill-conditioned behaviour and unpopularity of her captain, Sir Edward Belcher. A finely bound copy of this scarce important and innovative dictionary, using Malay phrases, customs, beliefs, and quotations from manuscripts in Marsden’s collection to describe the use and meaning of each word. With interesting provenance, formerly owned by Jonas Daniel Vaughan [1825-1891] a prominent lawyer in Singapore, who attempted but ‘found the task of compiling a supplement to the Malay-English dictionary to be too complex’, as can be seen by his numerous pencil notes and marginalia in this copy. It was later owned by Dr. C. H. Wheeler a Singapore surgeon. William Marsden DCL FRS (1754-1836) was a distinguished Irish orientalist, linguist, numismatist and pioneer in the scientific study of Indonesia. He joined the East India Company at the age of 16, and was sent to Sumatra. ‘While in Sumatra Marsden developed an academic interest in the Malay language and related tongues that was to last the whole of his life’. He began work on his dictionary in 1786, it was published together with his ‘Grammar’ in 1812. ‘These were his most significant and enduring linguistic works. The dictionary, in particular, broke new ground in terms of methodology. Unlike many previous dictionaries and word lists, Marsden used Arabic characters for the Malay words and arranged the entries following the alphabetical order of the Arabic characters. Another innovation is the inclusion of examples of phrases from native sources, many of which were taken from manuscripts in his collection.’ - King’s College London, The Marsden Collection. The Treaty Ports of China and Japan - Wm. Fred. Mayers, N.B. Dennys, Chas King. As trade between the East and the West grew in the mid-nineteenth century, increasing numbers of Westerners travelled to China and Japan, and in 1867 this guide to the key port cities such as Hong Kong and Nagasaki was published in both Hong Kong and London. Its editor, Nicholas Belfield Dennys (1813-1899) claimed it was the first such comprehensive handbook printed for public distribution. Intended for visitors and new residents, the guide was originally typeset in China, allowing place names and other words to be printed in Chinese characters. The book includes physical descriptions and brief histories of twenty three Chinese cities and six Japanese cities, details of schools and libraries, population statistics and much practical information, as well as a list of other publications on China and Japan. Published shortly after the major expansion in Treaty Ports effected by the Second Opium War in China (1858 -1860) and the Harris Treaty in Japan (1858). A complete copy of this rare guide book, a fascinating and detailed study of 23 ports in China and 6 in Japan, The 28 fragile and specially commissioned maps, engraved in China, 27 of which are printed in red, are almost invariably missing from the few copies which turn up. In addition to the invaluable maps, the book is a mine of information on every imaginable facet of China. It is also one of the best early sources of information on Hong Kong. 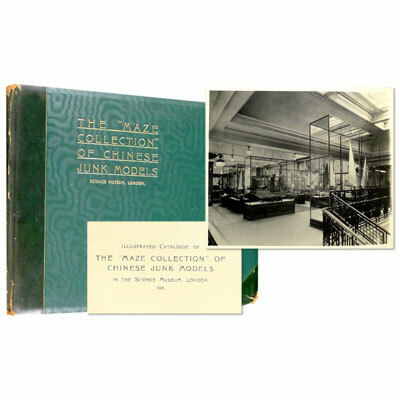 A rare work detailing the unique collection of ten large-scale models of Chinese junks, presented to the Science Museum, London, by Sir Frederick Maze, inspector-general of Chinese customs in 1938. The models were built in Hong-Kong or Shanghai by Chinese craftsmen, under the supervision of George C.L. Worcester and are accurate replicas of these sailing craft in every detail, down to the shrines and household gods. They include examples with the magical eye on the prow. 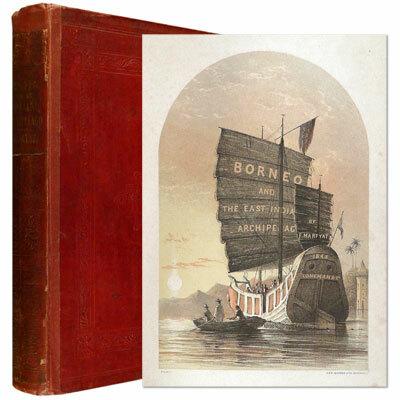 Illustrated with 18 large photographic plates, detailing the ten junks of the collection and the Fukien Sea-Going Junk model donated to the Musée de la Marine in Paris. A presentation copy ‘With the compliments of Sir Frederick Maze, Inspector General of Chinese Maritime Customs and Administrator of the Chinese Lighthouse Department. 1929-1943.’ We believe copies of this work were printed in a small number for Sir Frederick Maze, and the only other copy we have seen includes the same compliments slip. A handsome volume of this enduring work on mountaineering, the enthusiastic and irrepressible narrative of Nina Elizabeth Mazuchelli who, together with her Army chaplain husband, Francis, and their friend ‘C’ (the District Officer) traversed the Nepal-Sikkim frontier along the Singalila Ridge – they almost reached the Tibetan border before a blizzard forced them to turn back. Despite their retreat, Mrs Mazuchelli was the first English woman to travel so far into the eastern Himalayas. Profusely illustrated with 10 full page chromolithographic plates and numerous in-text drawings and sketches by the author, together with a folding map of Sikkim, the travelling party’s route marked in colour. An extremely rare and fine little one-off production, only printed for this particular season. As explained in the foreword ‘For certain reasons it was deemed undesirable to publish the accounts of the past Season’s Hunts in the daily press, but in order that a complete record of the sport during 1929-30 might be preserved for future reference, the Stewards considered that it would be much appreciated, both by members and friends, if some account of the Hunts held could be published in pamphlet form.’ Why it was ‘deemed undesirable’ they do not explain. 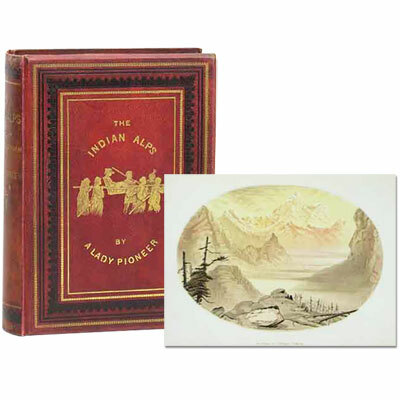 A fine copy illustrated with 20 photographs and two sketches. The resume covers nine Paper Hunts and three Handicap races from November 24th, 1929 to February 23rd, 1930. With a list of events for the Shanghai Hounds’ Drag Hunts Season of 1929-30 to the rear.